Synthesis SyncML Clients for mobile devices (PDA) bring SyncML compatibility to widespread mobile OS platforms like Android, PalmOS and Windows Mobile. iPhone, iPad:These products are now available from plan44.ch. PalmOS based devices with PalmOS 4.x-5.x like Palm Treo (including 700p, but not 700w/750), Zire, Tungsten etc. Synthesis SyncML Clients are designed to add SyncML synchronisation to existing applications with a minimum effort, and thus making them instantly compatible with any CRM, Groupware System and other application which supports SyncML. 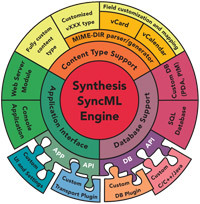 Synthesis SyncML Clients can be directly integrated with existing SQL based applications via the ODBC by simply editing a single XML configuration file, or alternatively by writing custom database adaptor plugins in C, C++ or Java. ODBC/SQL based and plugin based data sources can be mixed in a single setup. They feature exactly the same fully functional SyncML implementation as in the STD and PRO products, so they are very well suitable for compatibility tests and experiments. DEMO versions are restricted to a simple, text file based database format, while the full versions (STD and PRO) have SQL/ODBC and custom plugin database integration capabilities. 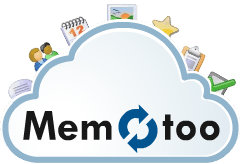 Synthesis SyncML Server and Client products with SQL/ODBC/SQLite/Plugin database interface can be evaluated for free during 60 days (more upon request). If you are a registered user of this website (registration is free, see below), you can now directly request a free 60-day evaluation license that will immediately be sent to you by email. As a registered user, you can always download the most recent version of the server and client software as PRO or STD versions for all supported platforms, as well as the latest Synthesis SyncML SDK yourselves. To get access to these downloads and to the free evaluation license, you need to login at our website - you can register for free if you don't have a login yet.